The real Danish military boots are obligatory marked with the Danish royal crown above the abbreviation "HMAK" ("Hærens MAteriel Kommando", i.e. "Material supply office" of the armed forces of Denmark). 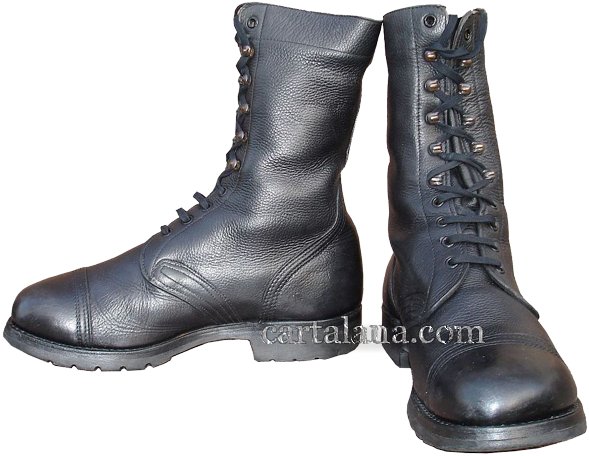 To the left and to the right of the "HMAK" abbreviations the first two and the last two digits of these boots production year are indicated. 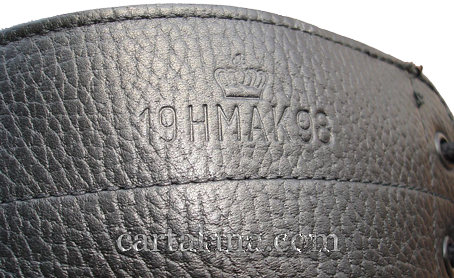 For example, "19HMAK98" means that this pair of boots were manufactured in the year 1998. 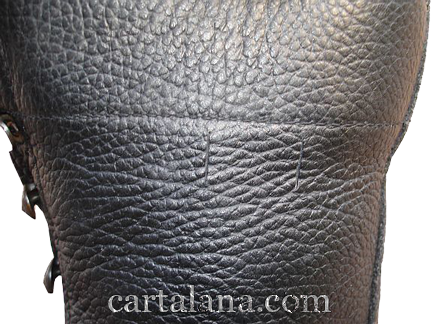 This marking is indicated outside upper parts of the boot's top. 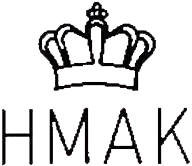 "HMAK" is one of the oldest institutions in Denmark, its predecessor was established back in 1596 in order to optimize the accounting and control of the Danish army material support by the King, and the name "HMAK" was in use since November 1, 1968. This organization was involving more than 1,100 military and civilian personnel in the second half of the 20th century, being responsible for all the matters related to the production, supply and delivery in the armed forces. 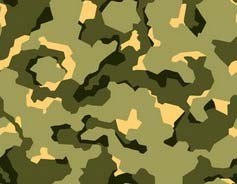 "HMAK" was ensuring quality control over all the aspects of military supply, starting from the soldier's diet and ending with large military equipment, uniforms and footwear. On January 1, 2007 "HMAK" was transformed and enlarged, having incorporated the Material supply offices of the Danish Air Force and the Navy. Nowadays this institution is called FMT ("Forsvarets Materiel Tjeneste" - i.e. 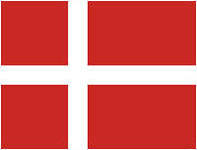 "Material supply Command of the Ministry of Defence of Denmark) and subordinates directly to the Danish Minister of Defence. These boots feature no lining inside, but the inner upper part of the boot's top has an extra band is leather, which also bears the identification marking: the early boots were marked with single digits, while the size was indicated by the code of one or more holes. 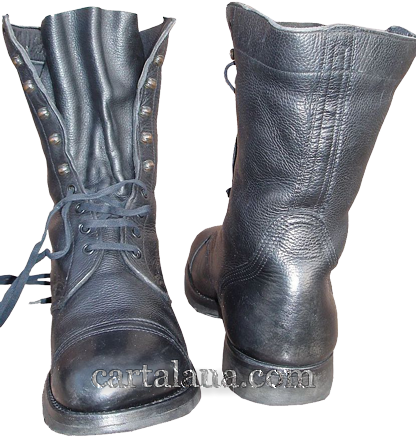 Since the 1980s, the three-digit size number was indicated along with the width of the boots, these indications use to be separated by slash. 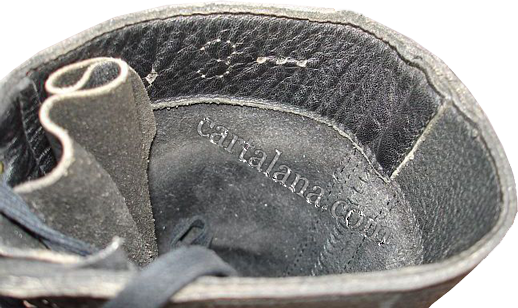 If the Danish military boots had been written off an army warehouse and put on sale in the civilian market, this can be easily distinguished by "demilitarization" perforation (two longitudinal cuts) on the inner sides of the boot's top. The Danish Ministry of Defence is sufficiently loyal to the future owners of Danish army boots, having not spoiling the boots too much, as opposed to, for example, their Austrian colleagues. The Austrian Bundesheer adheres to the procedure of cutting large (up to 1.5 cm in diameter!) circular holes in the tongues of each pair of "demilitarized" Austrian army boots. The Canadian Ministry of Defence, for example, uses to cut the upper sides of the "demilitarized" boot's tongues with scissors. In winter time the Danish army boots are insulated with additional insoles and wool socks are to be used. Of course, one should choose the boots one or two sizes larger than the boots worn during the warm season. Usually the Danish boots are wide enough by size (they mostly have wide width). The boot's tongues are not round-shaped on top, but almost square-shaped. 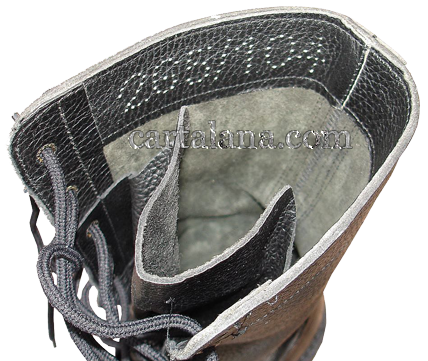 The boot's flap is almost closed and stitched to the level of eight's pair of eyelets, counting from the down. 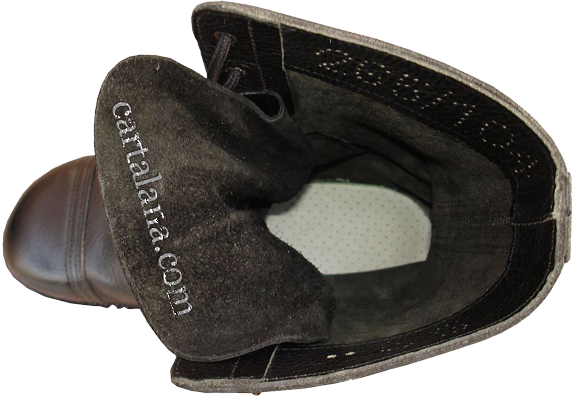 The tongue is one-layered, and no additional padding inside the boots or tongues is provided. The Danish boots lacing system eventually modified in the direction of further simplification: at first they used the system " four pairs of simple round eyelets on the lower part of lacing, then five pairs of bronze hooks for lacing above, and an additional pair of round eyelets on the top (this peculiarity is typical for most Danish army footwear). Further on the hooks were replaced by simple round-shaped eyelets.